We welcome all campers — beginners, intermediate and advanced players — who want to have fun and improve their tennis game! Our mission is to provide a highly organized, active and energetic tennis camp featuring a Rally and Play, game-based approach. 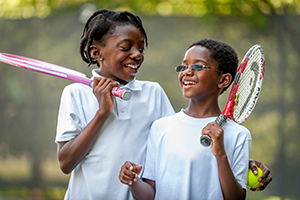 The tennis program is led by Columbia Association’s certified professionals and a team of trained camp staff who are equipped with experience developing junior tennis players. Each morning session focuses on dynamic warm-ups and specific themes with appropriate drills emphasizing tactical and technical development. Afternoon activities include recreational swimming and games at a pool that has tennis courts and a basketball court. The afternoon tennis sessions include an application of the specific themes in a game-based setting. The second week focuses on match play and a three-level Grand Slam Tennis Tournament. Campers must supply their own racquet. What to bring: Campers must wear tennis shoes (no black soles), and it is suggested campers wear loose-fitting, comfortable clothing and socks. A hat and sunscreen are recommended for outdoor activities. Campers should bring a swimsuit and towel, a healthy, nonperishable lunch and a refillable water bottle.